CraftyTimes: My Newest Knitting Project! I’m what you’d call a “fair-weather” knitter. Actually, since I almost always decide to knit when the weather gets cold and grey and snowy, I’d probably change that to a “foul-weather” knitter. To that end, I tend not to knit much, or do only one project per year, if that. In the winter of 2011-2012, I was inspired to knit my face off for my then-newly-arrived little nephew; he got two blankets and a wee little scarf out of me over the season! Then, I dropped my knitting for fair weather pursuits, and only recently since I’ve been feeling better from my epic bout of the flu (no WAY that wasn’t swinelike in nature, letmetellyou), I’ve decided to pick it up again. I was visiting my dear friend, Erinyth, in her new digs this last weekend with her mother, and so I thought I’d drag a ball of yarn and some needles with me to see if inspiration would strike. Well, it turns out that we all had the same idea, and so Sunday evening the three of us all sat down with our knitting projects and had a whale of a time! Why yes, I do live an exciting life, thank you for asking. I’m still working on learning different stitches and designs, so I wanted to try something different that would have me using both my knit and purl skills. Erynith suggested I try doing squares, 5×5, and it turned out so nicely I can’t wait to see how the finished product is going to turn out! I still have an annoying tendency to make my stitches too tight, and I’m sure that using these tiny metal knitting needles aren’t helping, but I’m figuring it out as I go along. I love these needles, even if they are a gauge or two too small; they were my mother’s and I think of her every time I use them. Erynith liked it so much, she requested a patchwork lap throw from this yarn and stitch style; I guess I have my new project to work on after all! EDIT: In case anyone is interested in trying this pattern, I thought I should add it here. It’s ridiculously simple! Step 1: Decide on the width of your project (make sure it is an even number, to make your life easier), and choose the appropriate needle gauge and yarn thickness you prefer. Step 2: Cast on in any way you like, once again ensuring you are working with an even numbered row. For the second row, knit 5, purl 5; do this to the end of the row. For the third row, slip the first stitch, and knit 5, purl 5 (including the first slipped stitch in the count). Continue this pattern until you have a series of squares. (I cannot give you an accurate row count as each needle gauge and yarn thickness will necessitate a different number of rows to create a square). For the following row, slip your first stitch, then do purl 5, knit 5 (including the first slipped stitch in the count). Continue this pattern until you have your next set of squares. 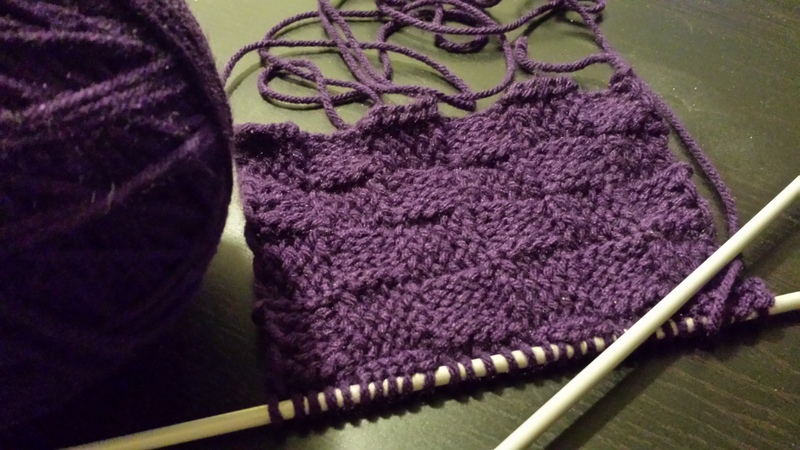 Continue alternating between “knit 5, purl 5”, and “purl 5, knit 5” as you create squares, until you have made your project the length you desire, then cast off. See? Simple pimple! Good luck to you all who attempt this, and let me know in the comments how you have fared! Next Post Random Post is Random.